When it comes to unforgettable getaways, Alaska Rewards searches high and low for the best mini-vacations we can find. Then we get discounts that are truly awe-inspiring. With this weekâ€™s Alaska Escape you get 2 round trip tickets from Anchorage to Valdez on Grant Aviation. You also get 2 nightsâ€™ accommodation at the Best Western Valdez Harbor Inn, and shuttle service from the airport to the hotel. This package would cost you $936 if you didnâ€™t have Alaska Rewards here to get you the lowest possible rates. We worked overtime and got the whole package down to just $399! Thatâ€™s a 57% discount off the rack rate. You also have till September 14th, 2011 to use your package! Once you check into the Anchorage terminal ofÂ Grant Aviation you can sit back and relax. As an Alaskan-owned and operated airline, Grant Aviation has been transporting passengers all over Alaska since 1971. Not to put it lightly, but youâ€™re in good hands with Grant Aviation. Valdez is home to 5 glaciers in the Valdez area that can be accessed by cruising, flying, walking or driving. Other summer activities include fishing, hiking, biking, and glacier trekking and rappelling. 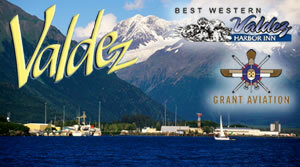 The Best Western Valdez Harbor Inn, is offering a two-night stay for two in a standard room. The hotel overlooks the Valdez boat harbor on three sides. They are only steps from local gift shops, Valdez Visitor Center, Valdez Museum, Whitney Museum and the Annex Museum that displays the old town Valdez before the 1964 earthquake.